Just last week I was looking at glorious mountains in Alaska. There is really no way to explain their grandeur and beauty and they continue to invade my thoughts. 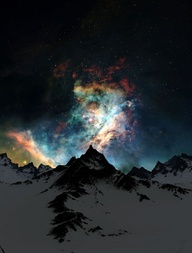 Mountains anywhere are stunning. They are enveloping, challenging, and impressive. They are also all over the Bible and are often places where both historic prophets and modern day people encounter God. Abraham sacrificed his son Isaac on a mountain. Noah’s Ark came to rest on Mt. Ararat. Moses climbed Mt. Sinai to receive the Ten Commandments. Jerusalem was built on Mt. Zion, which came to symbolize the Promise Land for the Jews. Mt. Zion is also believed to be the burial site of King David and where Jesus and His apostles conducted the Last Supper. And that’s just the Old Testament. In the New Testament, mountains are just as prevalent. In His “Sermon on the Mount,” Jesus gave us the “Our Father,” the New Law, and The Beatitudes. His Transfiguration takes place on top of a mountain and he is put to death on Mt. Calvary. A mountain top is perhaps the perfect place to encounter God. The sky is grand, the air is clean, and heaven just feels a little bit closer. 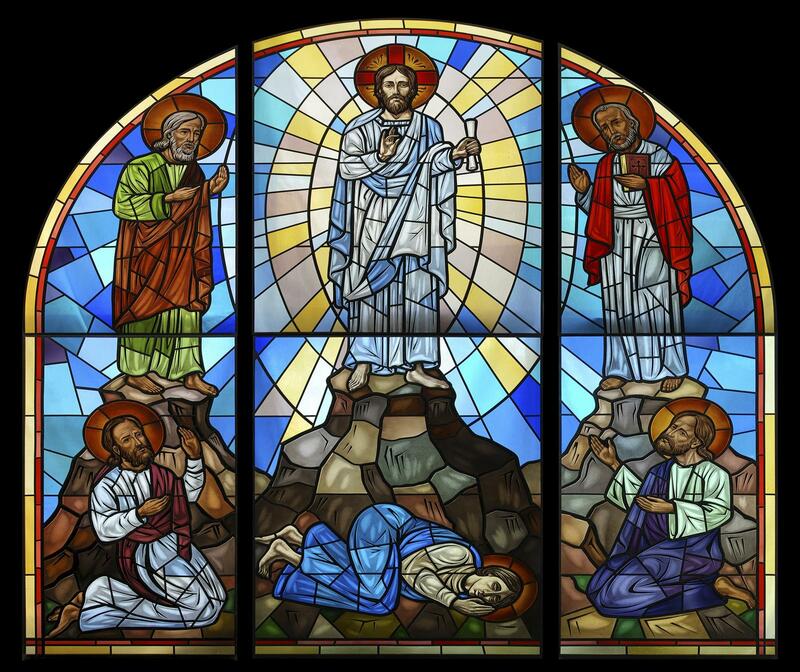 Maybe it’s all just symbolic, but let’s hike up and look at The Sermon on the Mount and The Transfiguration this Sunday and see how our lives can be affected by them. It’s been 2,000 some years since Jesus preached his Sermon on the Mount, but it is as pertinent today as it was then…perhaps even more so. Matthew’s gospel tells us that Jesus “went up into a mountain and when he sat down, his disciples came to Him.” As He spoke to them He gave them The Beatitudes, reiterated the Ten Commandments, and taught them the “Our Father.” Wow. It was definitely a busy day on that mount! 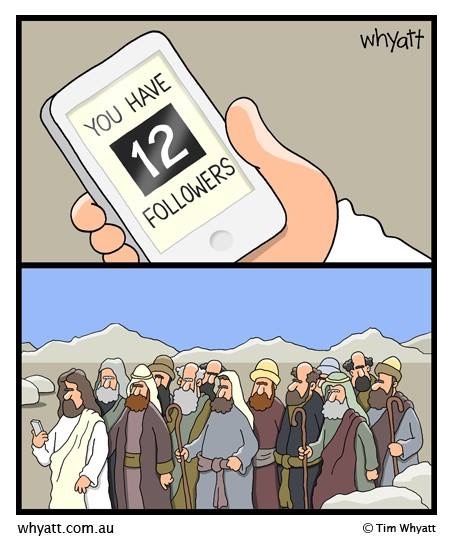 What I love about this story is that unlike Israel and Moses, who received The Ten Commandments with great fanfare and pageantry, the Sermon on the Mount was much more serene and tranquil. Many believe Jesus picked the quiet mountaintop setting to deliver his message so His listeners would truly hear what He had to say. Mountains have a way of amplifying the senses and boosting mindfulness. What’s also interesting about the story is that Jesus didn’t start His visit with the Commandments. He began first by describing who will be blessed by God and giving them the Beatitudes, which are basically acts of virtues by grace-filled souls. He says the kingdom of heaven is for those who “are poor in spirt, mourn, meek, thirst for righteousness, merciful, pure of heart, peacemakers, and are persecuted for the sake of righteousness.” The first four deal with our relationship with God and our personal needs, while the second four focus on our relationships with others and our responsibilities. In a way, these teachings steer us away from what the world today is steering us toward. We are called to be meek, humble, and pure; not exactly the virtues seen on TV, in music, and on social media. So Jesus first taught how to be, then he taught how to pray with the “Our Father” and warned the disciples not to be hypocrites and publicly pray in loud ways but rather to “go into your room, shut your door, and pray to your Father.” He also brought up the issue of wealth, suggesting we look inward and ask ourselves “where is our treasure?” and “which master do we serve?” and instructed us to be both “salt of the earth” and “light of the world.” Our good works should shine before all and glorify God. Then, He laid down His New Law. These “laws” can be found in both Hebrew and Christian Bibles, and we’ve all heard them and know them. Thou shall not kill, thou shall not commit adultery, turn the other cheek, and even love your enemies. They include instructions to worship God only, honor our parents, and keep the Sabbath holy; as well as prohibitions against idolatry, blasphemy, theft, dishonesty and even coveting. No pressure, right? It is said The Beatitudes are how to become disciples and The Commandments are how to be Christians. It really all comes down to choices. We are instructed to make proper choices based on God’s instructions in the Bible rather than following the crowd and taking the easy and self-gratifying way. Then there’s the Transfiguration where Jesus takes Peter, James, and John to the top of a mountain and is transfigured before them. Trans what? Transfigured, meaning Jesus shone bright with rays of light, Moses and Elijah appeared next to Him, and a voice from the sky called Him “Son.” The event is considered one of the miracles of Jesus, is the only miracle that happens to Jesus himself, and was called “the greatest miracle” by St. Thomas Aquinas. You could say God physically invaded Jesus’ body and in the same way don’t we all want God to invade our lives? Maybe the idea behind all the biblical mountain references is that the higher up you go, the closer you are to God. We all have mountains in our lives, many of which we create from molehills. Climbing a mountain is physically difficult and finding a spiritual “mountain” in which to pray can be just as hard. 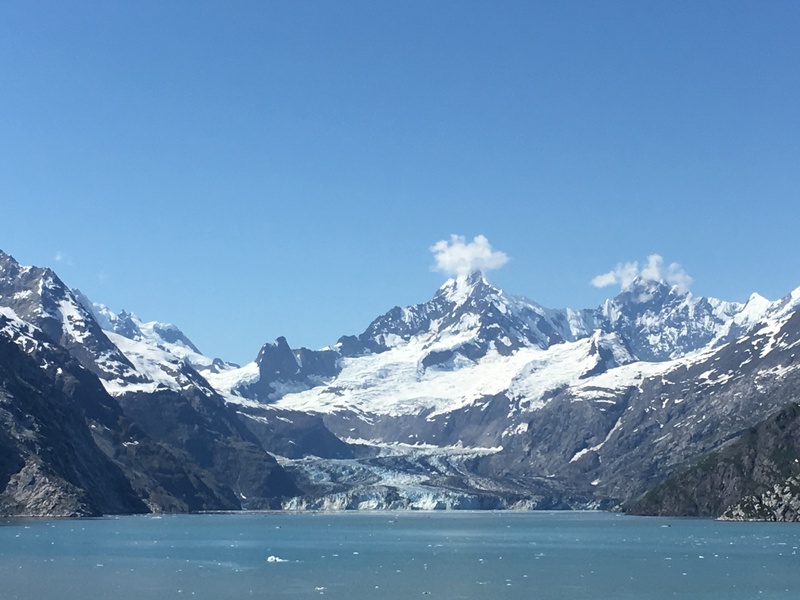 It is a struggle even Jesus encountered as He was tempted when “the devil took Him up to a very high mountain and showed Him all the kingdoms of the world in their magnificence.” I wish I could return to Alaska and go pray in those mountains, but “mountain” can be figurative too. Our “mountains of prayer” can be the shower, a church, a quiet room in the house, the beach, even our car. A real mountain can be a cathedral in so many ways. Whatever peak you choose, wait and listen for God to reveal Himself to you. Like Jesus, we just need to take the time to walk away from our busy lives and make the effort. Through dedication we can climb those mountains and we will not hike them alone. God is willing to meet us halfway. Are we up for the climb?